Challenge Yourself; Stay Turned Up! So we are quickly approaching the month of March. Its last week marks the close of the 1st quarter of 2015. 3 months, 12 weeks and 89 days to be exact. Reminiscing back to when the clock struck in a new year, I can only imagine how many resolutions and promises were made to get focused on fresh agendas. By this time, many are beginning to feel the faint sense of slowing down, procrastination, and wondering if the journey is worth it in the first place. I relate with those sentiments to the fullest! One of my self-commitments this year was to finally focus on my writing. I believe it is a natural God given gift. However, I lacked confidence for years and stuck in wondering if I am “Good enough.” So 2015 comes in and I finally get the gull to take a chance on me; what do I have to lose? My friends, family and associates have all told me that I have it so why not give it a go! They have my back and are my initial fan base. They will hold me accountable if I try to give up, Right? ; WRONG!!!! It has been 1 month and 12 days since I launched my blog; my big debut of Chanel’s courage to share her talent with the world. I chose to launch on my Birthday as an extra gift to myself. I was super excited about taking a chance on the new me! Surely I would have double digit followers within the first few weeks; At least 20, right? ; Another WRONG. I have 9 to date after 43 days. My initial reaction was major discouragement. Out of nearly 300 contacts on social media 9 signed up and this is after I asked twice to perform a 30 second task. Refusing to ask again, I was forced to think and research different ways to promote my writing. This is not going to be easy but I have declared its worth it….. 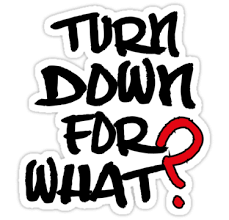 When I consider the recent popular song entitled “Turn Down For What?” by DJ Snake and Lil Jon, it exudes excitement and energy that seems to never end. It’s infectious and contagious! When you add others in the mix of the hype, it’s much easier to remain on a focused high than going at it alone. People influence people; but what if it’s just you; then what? Maybe you have made resolutions of your own and have already faced lack of support with that weight loss goal, returning back to school, finding a new job, going from permed to natural hair, starting that business, or some other adventurous thing that you felt would be a turning point in your life. When you started off you just knew that certain people would be there but they are not. People are really busy themselves. They may temporarily be absorbed in pressing life issues that are taking precedence in their own lives right now. Don’t give up on this group, they may eventually become your biggest fans once their own smoke clears! Have you pitched too many new ventures in a short period of time? If this is the case, for those who know you, it’s going to take some time for you to show that you are committed to your new plans and show results. Once you do, your fan base will expand instantly. Take this time to Show and Prove! How do people in your circle think? Are you connected with a greater percentage that don’t put emphasis on what you are interested in? Are they just existing from day to day and don’t have anything going on of their own? Love them but find a way to even out your crowd. Doers are better than Sayers any day! Stay Focused By Any Means Necessary – Stay turned up! Have your own hype party but don’t quit; it should never be an option! Remember the excitement you had when you first started and find a way to keep that ignited. I use motivational quotes, prayer, audio books and music to stay centered. Picture Completion – What do you look like at the end of this thing? See it before you get there and dreaming about that vision should help you to not drift backwards. You can’t embrace what’s ahead if you keep going in the opposite direction! You already know that outcome so stay doing something different by moving ahead with or without people! I will take my own advice and put it into practice daily. For I know the danger of getting to month number 6 of a New Year. This is when most resolutions are completely abandoned and buried. Don’t want to become a part of that statistic and get back into a vicious cycle and making more promises to myself at the beginning of 2016. I hate starting over!! !